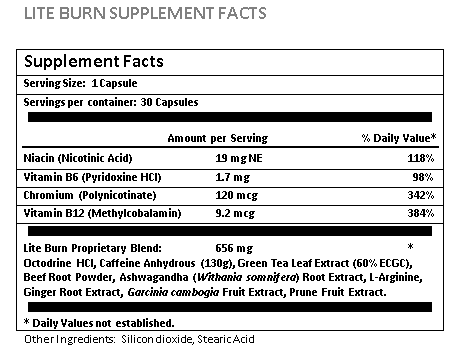 All Natural Weight Loss, LiteBurn, encourages healthy weight loss using thermogenesis to increase metabolism. Garcinia Cambogia works to suppress food cravings and reduce the production of fat cells, while promoting the growth of healthy fat resistant cells. LiteBurn is not only a weight loss aid – it increases the blood flow to the brain, promoting motivation, improving mood, and boosting energy. Eat a reduced calorie diet. It provides 24 hour support against damaging free radicals, and may help protect the body from cancer, cardiovascular disease, viruses, and inflammation. Thermogenic Fat Burner - LiteBurn acts as a Thermongenic: When you exercise, you naturally increase your body's core temperature, thus boosting your metabolism naturally. Our herbal thermogenic fat burners cause your body temperature to increase in a similar fashion, whether or not you are exercising, thus boosting your metabolism naturally and giving you rapid results! Boost Energy - LiteBurn's unique, herbal synergistic blend provides a natural boost of energy without the crash. Enhance Mood - Our balance of vitamins and herbs helps to increase serotonin levels, restore your balance, improve your mood and promote feelings of well-being. Increased levels of serotonin are known to increase blood flow and oxygen to the brain which can be highly beneficial, leading to not only better mood but also improved motivation, energy levels, and memory. With LiteBurn you’ll feel happier with your personal physique, leading to less stress, more energy, and a more joyous, balanced life. "I used LiteBurn for 30 days and lost 8 pounds. I didn’t change my eating habits, I just found that I wasn’t as hungry as I used to be." - Joey H.
"After taking LiteBurn for 2 weeks I noticed I was losing inches from my waist. My wife said I look slimmer and that is a good thing. I also had an extra boost in my energy levels." -Tony G.
"I take Lite Burn as soon as I wake up in the morning before I go to my work out and it gives me the energy I need. Karl K.
"I love the smooth energy from taking the Lite Burn formula and I averaging 4 pounds per week and I am losing inches." -JI. from Florida. I was excited to start taking LiteBurn myself after I gave a friend of mine a bottle and he lost 10 pounds without starving himself. Like me, he had tried everything he knew of but was unsuccessful at losing the weight that he needed to lose. For me, LiteBurn works because I no longer crave sweets and am able to control my appetite. I have found that I can no longer eat the portions of food that I was eating before I started taking LiteBurn. Not only does this help me to not gain weight, but I am saving money by only eating half portions. And the Energy I get from this is amazing. If you are trying to lose weight, I definitely recommend giving LiteBurn a try. It’s worth it. Warning: Not intended for use by person 17 years or younger without the supervision of a health professional and parent/guardian. Keep out of reach of children. Not for use by persons who are pregnant/nursing, sensitive to caffeine, a medical condition, or are taking MAO inhibitor or ADHD drugs. Consumption contrary to warning may cause adverse health effects. If unpleasant effects occur, discontinue use.